Hi lovelies! I hope you're all doing well, I'm in a fab mood because it's friday and tomorrow is the first Saturday I've had off in ages, which is exciting! What was even more exciting about today though, was getting home to find a big box from the USA waiting for me. This box was from the international beauty swap I did with the lovely Ashley from http://www.jaimeombre.com/. Though this only arrived today, I was far too excited to not post about it tonight (hence the late post) so let's get right into everything! First things first, I think Ashley is my long lost sister, while I did give her a few brands for inspiration, I didn't give any specific things that I particularly wanted to pick up, but everything she picked out for me are things I would definitely have picked up myself. 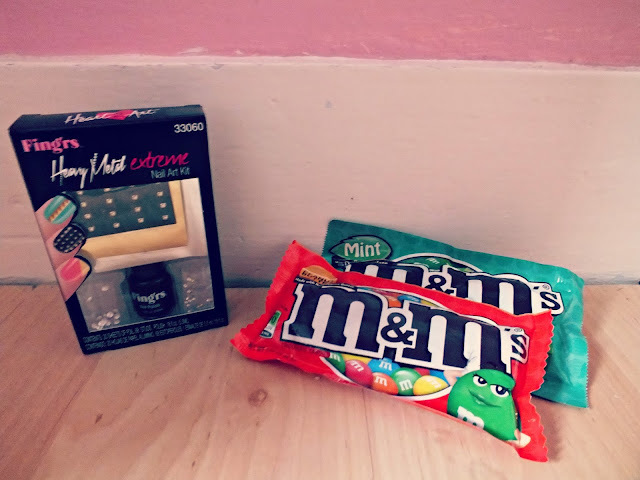 Even down to the mnm's ;) I'm literally only just getting round to sending her box as I ordered some bits and bobs for her online and the Royal Mail is totally useless. I'm so excited for her to get her box now though and I so hope she loves it as much as I love mine, though I'm not sure that's possible! I literally squealed opening this lovely lot. I even went as far as busting in on my poor sister Hannah (who was in the bath) to show her everything! First thing I saw when I opening the box was the gorgeous Victoria's Secret makeup bag, which was enough for me as it is, how beautiful is it, seriously? Then when I finally got over the stunning makeup bag (and yummy sweets) and started opening each lovely individually wrapped item, I literally could not contain my excitement. First up, she picked out two body lotions and one body wash/ scrub from Victoria's Secret, along with some tweezers and a bronzer, which I'm really looking forward to trying. I'm not gonna talk too much about any of this stuff as I'm going to be reviewing lots of it in the next few weeks. So watch out for that! Along with the body theme, Ashley also chose three body lotions from Bath and Bodyworks which is very exciting for us Brits as we can't get it over here, like I said I'll review these so I won't go on, but honestly, she could not have picked better scents, these are totally gorgeous scents. Another thing that completely thrilled me was the two pack of maybelline baby lips lip balms. These have just come to the UK apparently, but I haven't been able to find them anywhere, so once again review coming soon! She also sent me an EOS lip balm, which is fab as I've tried one before and loved it, but this one is pink, which makes it amazing, of course. 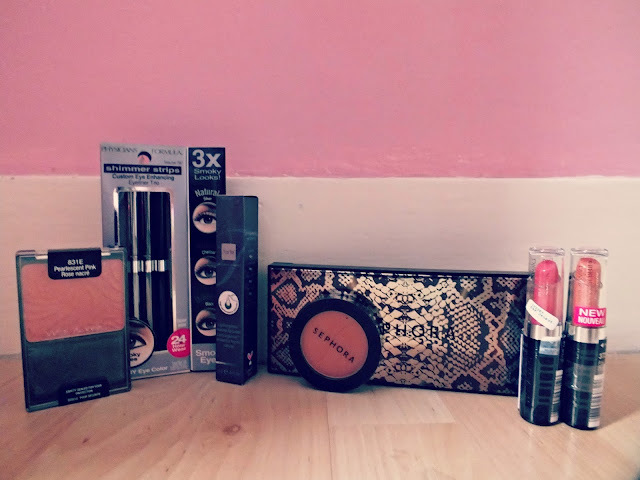 She also picked loads of gorgeous makeup bits from Sephora, Physicians Formula, Wet n Wild and Tarte, all brands I've not tried much of before so I'm super excited to give it all a go and review it for you all! I'd just like to say once again, thank you so much to Ashley for choosing all these amazing bits for me, it seriously was more exciting than Christmas! Let me know what you think of everything I received in this swap, is there anything you'd like reviewed? Aww this are stunning products!! I love the look of everything. I spotted the Maybelline Baby Lips today in Boots but they only had like 3 left and wasn't the one I wanted Boo!! I also love the look of the EOS lipbalms and I'm dying to try one! Lovely post & have a great Saturday off! Oooh what lovely thing's, I've tried the Bath & Body Works Amore Scent and it smells A-mazing! ah this looks incredible! 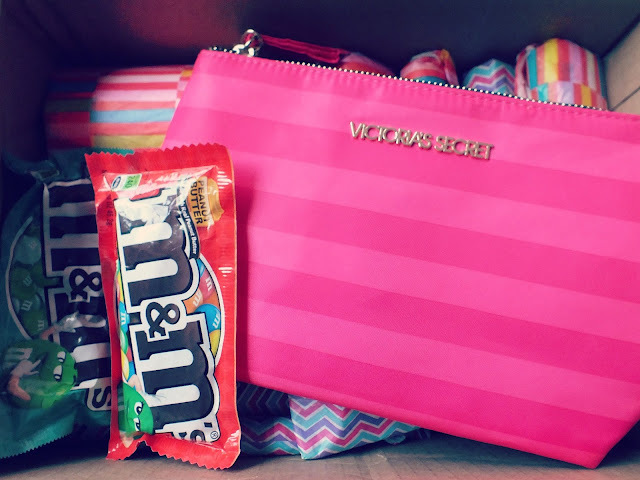 I love the fact she included the M & M's as well. I love the looj of all of the Victoria's Secret stuff. I love getting stuff in the post so this must have been so exciting for you! Great swap! I'm also doing an American swap I cant wait for mine to arrive. So lovely! Great swap I absolutely love bath and bodyworks so I'm super jel you got some goodies from there! Those M&M's look so yummy too! ah, how generous! she's sent you some beautiful bits. i'd love to have an overseas blogging friend to do this with! Why do USA products always look better than ours??! I need to go!